It is a day where people with disabilities and their advocates can speak about the issues that affect people with disabilities and celebrate their achievements and abilities. There are over 650 million people with disabilities all over the world (UN Enable). They are the world's largest minority. We are each guaranteed rights as human beings. Human rights are universal – they belong to everyone. Everyone has the right not to be discriminated against because of gender, sexual orientation, ethnicity, religion, disability, and other factors. The Convention on the Rights of Persons With Disabilities was created by the United Nations in 2006, and it is the first comprehensive human rights treaty of the 21st Century (UN Enable). It was first opened for signature on March 30, 2007. The CRPD is a treaty (agreement) made in writing between countries. Once a country agrees with a treaty, it signs it. When it becomes international law, it is ratified. It will then be put into the laws of that country. What does a country need to do once it signs the CRPD? To date, there have been 147 signatories and 97 ratifications to the CRPD. There is also Optional Protocol to the CRPD. 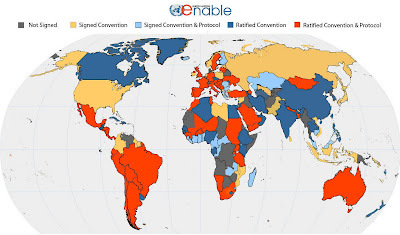 According to UN Enable, it is an international treaty that "establishes two procedures aimed at strengthening the implementation and monitoring of the Convention...the first is an individual communications procedure allowing individuals to bring petitions to the Committee claiming breaches of their rights; the second is an inquiry procedure giving the Committee authority to undertake inquiries of grave or systematic violations of the Convention." There have been 90 signatories and 60 ratifications to it. In the US, the national law that protects people with disabilities is the Americans With Disabilities Act. In July 2010, we celebrated the 20th Anniversary of the ADA and honored all those who made it possible. The ADA protects people with disabilities against discrimination in the workplace, transportation, school, health care, and public places. As of today's date, the US has signed the CRPD but has not ratified it.